The Explorer is made of impact-resistant acrylic. The high-quality red seal guarantees a long outdoor life. The included universal holder allows exact and optimal attachment. The mirror can be fixed either to the wall or to tubular posts (Ø 50-85 mm). The mirror is wind load tested up to wind force 12 (hurricane> 117 km). The Explorer mirror ensures an optimal field of view due to its very good mirror image and its strong wide angle. 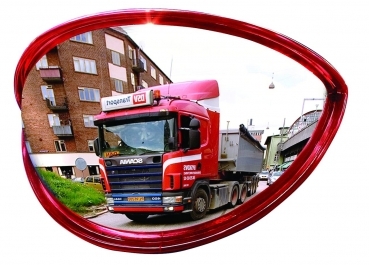 It is very well suited as an overview mirror in production sites and on the road, as it has a brilliant appearance. The mirror is TÜV certified.